You are at:AgEconMT»News & Posts»Crops»Is the 2017 Tax Bill a Possible Trojan Horse for US Agricultural Exports? 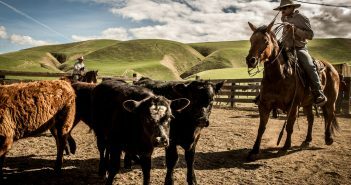 Is the 2017 Tax Bill a Possible Trojan Horse for US Agricultural Exports? 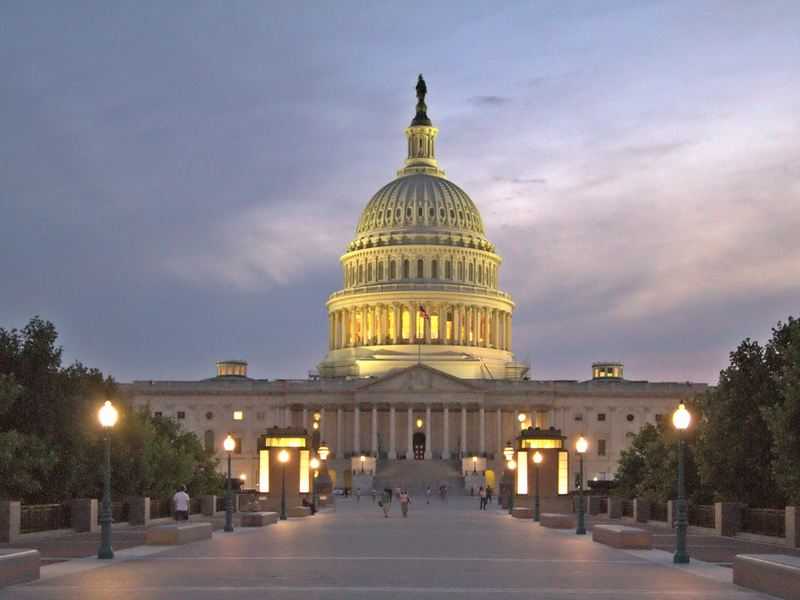 Proponents of the 2017 tax legislation argue that reducing the corporate tax rate and creating other tax incentives for business and individuals will increase economic growth and foreign investment in U.S. industries. 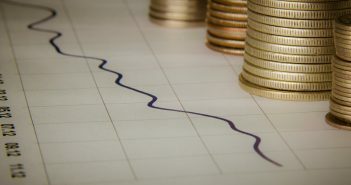 The legislation also increased incentives for higher investment in U.S. capital and businesses, which is likely to increase the value of the U.S. dollar. A stronger U.S. dollar is associated with decreased U.S. exports, because U.S. goods become relatively more expensive than goods from other countries. Historically, periods of higher U.S. dollar values against other major currencies have been associated with periods of decreased agricultural trade value. As the 2017 tax bill was being discussed and negotiated in late-2017, one of the main arguments that proponents of the legislation made was that significant cuts to the corporate tax rate, increased incentives for small businesses, and even individual tax cuts will boost economic growth in the United States. And while initial analyses of the tax bill’s impacts have led to mixed forecasts about the magnitude of potential economic expansion, the legislation certainly includes many provisions that incentivize U.S. companies to repatriate funds from outside of the United States, keep new profits in the country, and increase foreign direct investments in U.S. industries. One likely medium- and long-run implication of this increased domestic investment is the increased demand for the U.S. dollar, and consequently, an increase in the dollar’s value relative to other currencies. From a consumer’s standpoint, this is a good thing: imports sold directly to consumers become cheaper, U.S. companies that purchase inputs from abroad will see lower operating costs, and that double espresso that you buy on your next trip to Italy will cost you less. However, for U.S. industries that rely heavily on exporting their products, a stronger U.S. dollar would not be welcome. One such industry is U.S. agriculture. For the U.S. agricultural industry, exports account for approximately 20% of the total production value, have consistently outpaced agricultural imports, and have been valued at $130-$150 billion over the past decade. As such, a stronger dollar would likely make U.S. agricultural products less attractive, especially as other countries (with much less valuable currency) are becoming increasingly active competitors in the global agricultural trade market. The figure below provides a characterization of general trends in U.S. agricultural trade value and the strength of the U.S. dollar relative to other major currencies since 1972. The figure also points out tax legislations that have been enacted during that period. The figure provides several insights. First, there appears to be a fairly evident negative correlation between the U.S. dollar value and agricultural export value. That is, in periods when the dollar is stronger, U.S. agricultural export value is relatively lower. 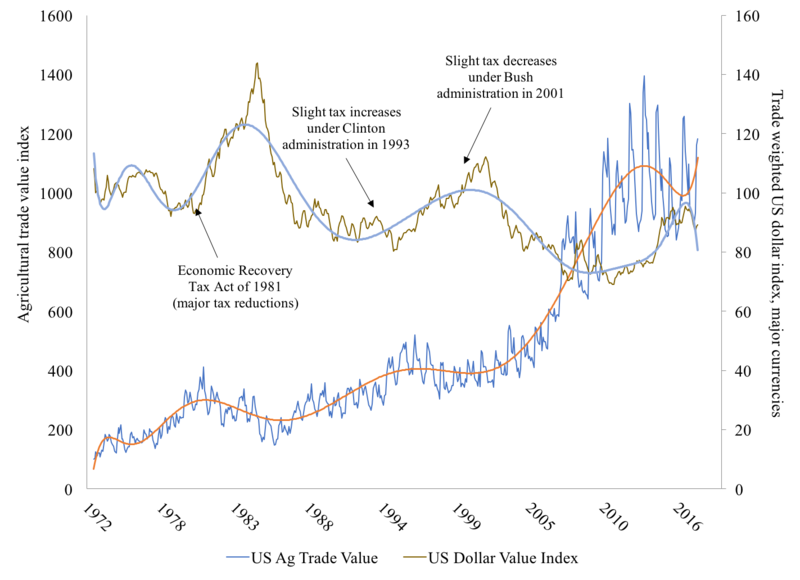 The graph also shows that after the 1981 Economic Recovery Tax Act—the last major tax overhaul prior to 2017—the value of the U.S. dollar significantly rose, while the value of agricultural exports declined. However, legislation that enacted smaller changes to the U.S. tax structure does not appear to have had major impacts. This raises several interesting and important questions: What will be the impacts of the 2017 tax bill? Could we see a similar period of export decline as in the early 1980s? Or has the U.S. and global economies and the agricultural trade landscape changed? Certainly, more rigorous analysis is needed to more accurately assess whether links exist between major tax legislation, exchange rates, and agricultural trade. However, economic theory about the connection and at least some empirical evidence does provide food for thought and discussion as well as an important economic issue to watch as the impacts of the 2017 tax legislation began to take shape. What are your thoughts?